Created a shovel-ready Master Plan with site work approved by the town of Lancaster. Replaced the roof of the elementary building. Removed the underground oil tanks. Connected to Nation Grid, increasing energy incentives. Redesigned both athletic fields and expanded usable playing space. Improved the safety and flow of the pick-up/drop-off zone. Expanded and replaced the parking lot. As we move forward into our next phase of fundraising, we plan to replace the 50-year-old windows increasing heat efficiency. We will repair and update the bathrooms. And we plan to unite the buildings creating a safer and expanded space for our students. We are extremely grateful for the support from our church and school family. We know that Adventist education is a powerful ministry creating lifelong followers of Christ. Thank you for making a difference in the lives of our children. Each school year is ripe with changes and possibilities, and this year South Lancaster Academy has that in abundance. We are welcoming our returning and new students with some new faces in the faculty and a facelift to the parking lot, athletics fields and gymnasium. Ginnie Hakes is the Vice Principal (see story below). Damali Caine is the Religion Teacher/Chaplain. She comes from Pine Forge Academy in Pennsylvania where she taught religion. She relocated with her husband, Eric, and their young son, Nathan. Veronica Iria is the Business/Technology/Art Teacher. She is not new to SLA as she's taught art here part-time, but now she is a full-time teacher taking over the business, technology and yearbook classes as well. Karl Hernandez is the Maintenance/Transportation/Vocational Arts Director. He is well-known at SLA as a popular substitute teacher, but now is our full-time Maintenance Director and teaches woodworking and home repair. We are happy each one has joined SLA to continue to share God's love while they educate our students. Perhaps the most obvious changes is on the school grounds itself. A newly designed parking lot and pick-up/drop-off zone increase safety and efficiency. Both athletic fields, one by the elementary building and one by the secondary building, were leveled for improved drainage and usability. The gymnasium got a fresh coat of paint with the school seal and Crusader logo gracing the walls. We are extremely grateful to Allain Sitework and Comley Excavating, both alumni-owned companies, for their work on the parking lots and fields. Good things are happening at South Lancaster Academy. God is leading, we are following. When students arrive for the first day of school on Aug. 23, they will see a revamped drop-off/pick-up lane with clearly marked lines, a sidewalk with a curb to provide a safe walkway between the elementary and secondary buildings, more parking spaces, and a newly leveled sports field so our athletes don't have to play soccer in a muddy swamp. 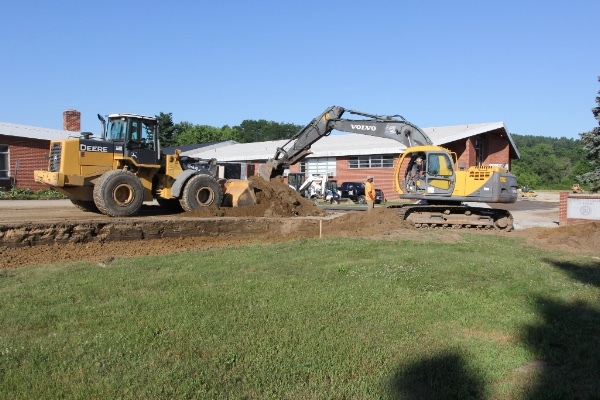 These improvements are possible thanks to generous donations of time and resources from Allain Sitework and Comley Excavating, both companies with ties to South Lancaster Academy as alumni or current parents, as well as your donations to our Building for Eternity campaign. Thank you for continuing to support South Lancaster Academy in providing improved facilities in which our students can learn and grow in their relationship with God.